Catherine is a California-certified nursery professional. Her interests are birds, insects, integrated pest management, & organic gardening. 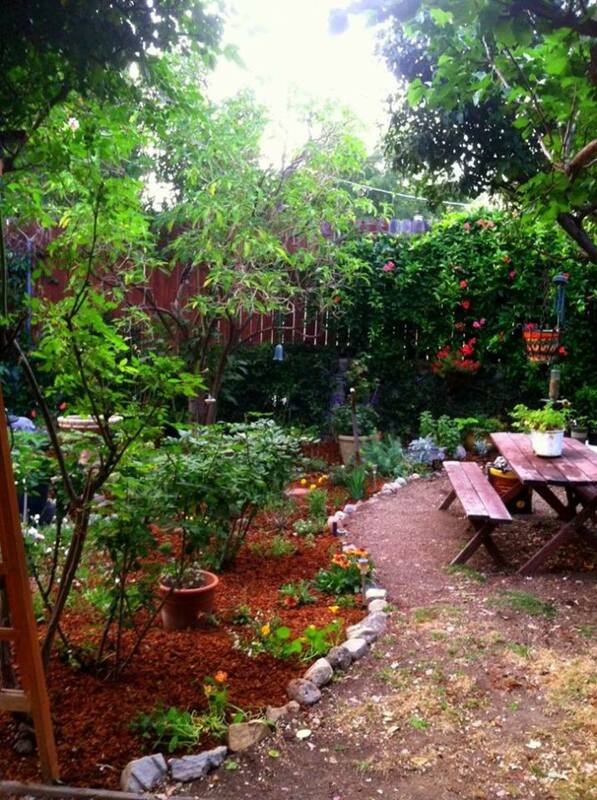 A garden can be anywhere one chooses to grow favorite things: succulents, herbs, edibles, flowers, trees or shrubbery. There is no rule about the size or location of your plot. Your garden can be as unique as you, the gardener, and should suit what you are willing to give it in terms of time and effort. A container garden or two can be just as satisfying to one as a planted acre is to someone else. Are you one who loves fresh picked fruits and vegetables and the spontaneous snip of herbs for your latest dish? Perhaps you love to arrange flowers, or you just enjoy relaxing in your private Eden where the birds sing and butterflies flit about. The first step is to consider your expectations. Second, evaluate your available space. Third, study your sunlight exposure. Lastly, think about the time you wish to devote to your garden. Urban gardens can be very successfully grown on balconies in containers and Earth Boxes or planted compactly in a backyard raised bed. If your soil is hardpan or dusty, and the expense and time of digging and amending doesn't appeal to you, a raised bed is the perfect solution. Stacking stones or building one from cedar planks to a height of 2 feet by 4 feet width by 6 or 8 feet in length will provide enough space to feed a family of four or more from a variety of edibles. The framework will need to be filled with a combination of compost and topsoil- approx. 48 to 64 cubic feet. Irrigation can be set up w/ drip systems or soaker hoses on a timer, so the garden wil receive consistent amounts of water even during vacation time. PVC pipes can be arched over the bed and attached with covers for cold protection, shade screens, or bird netting as needed. Raised beds are the basis of the French intensive gardening method and can support many plants for large harvests with less water, fewer weeds, and healthier outcomes. On a smaller scale, pots can be filled much the same way and watered by hand. The EarthBox System is designed to be self-watering and weed free and has an optional staking kit. It only takes a 1.5 cubic foot. bag of potting soil and can support enough veggies to easily feed 2 people. Dwarf fruit trees including tropical varieties and berries of all kinds do as well in pots as in the ground, so there really are no limitations to growing edibles except for the full sun requirements of 6 or more hours daily. 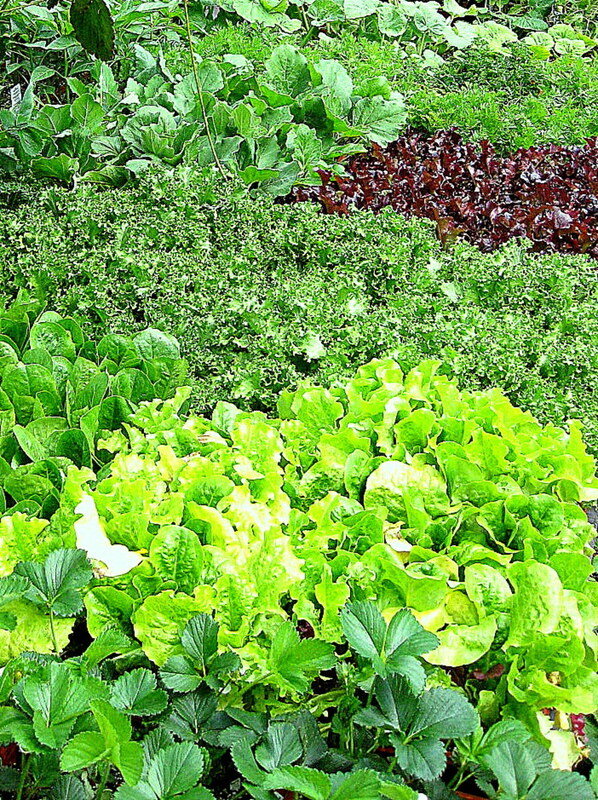 Leafy greens and tubers can grow in less light. Vegetable varieties are plentiful from hearty hybrids, to openly-pollinated heirlooms, to grafted combinations. 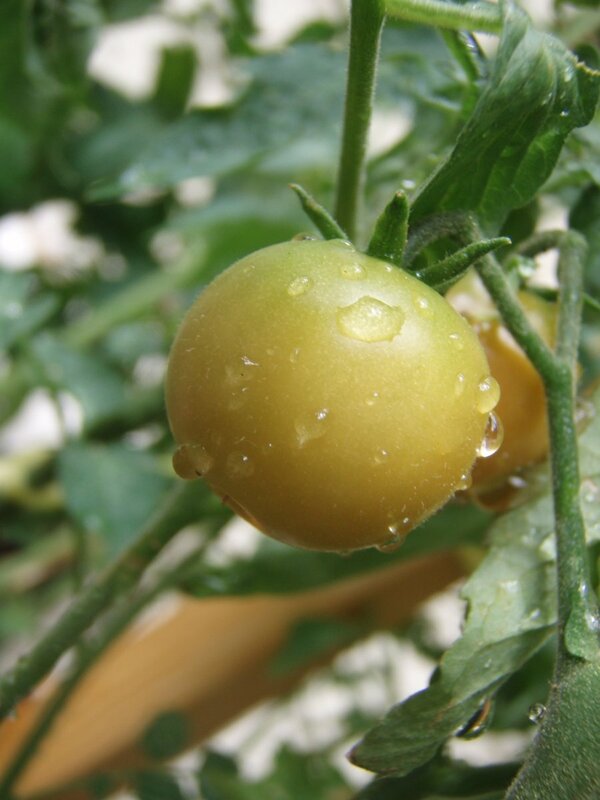 If growing in containers, look for determinate type tomatoes and compact melons and squashes. There are even upside down planting bags for those with small spaces who like to grow tomatoes w/o staking them. Who doesn't love a fragrant garden full of lovely flowers? It can enliven one's spirits and brighten the dreariest day. Flower arrangements bring nature's beauty inside, provide calming aromatheraphy, and tell our visiting friends how special they are. The real beauty is that it doesn't take a large space for loads of blooms. Unlike edibles, you can grow gorgeous specimens in either sun or shade. 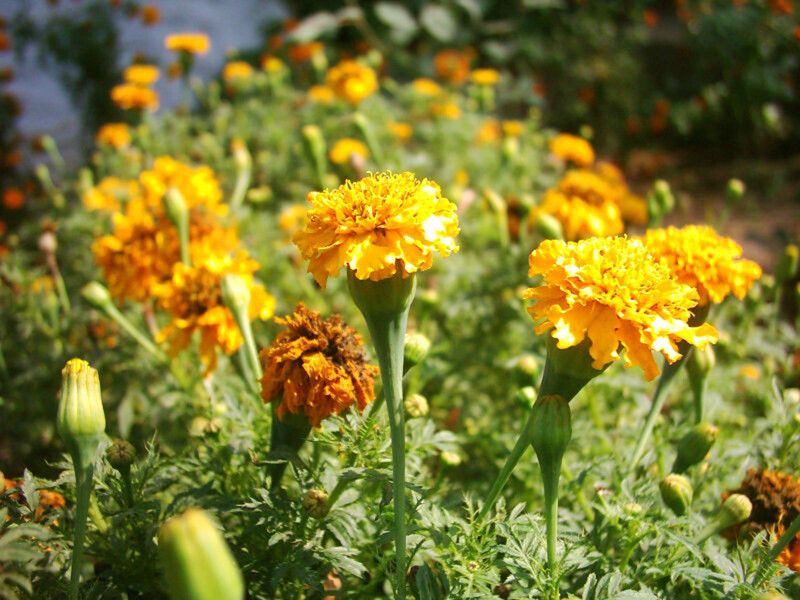 Flowers can be planted from seeds, bulbs, flats, and containers. There are the seasonal annuals with the showiest color for our flower beds, flowering shrubs like roses, camellias, and gardenias, and the hearty perennials that repeat their cycles year after year. I think the perfect gardens use all of these for non-stop performance. It may be a bit of work up-front, but those bulbs and perennials will pop up each season like clockwork. Lilies, tulips, peonies, Irises, alstromeria, ranunculus, dahlias, gladiolas, and narcissus are all examples of bulbs that are ideal for cutting. Biennials that grow one season and bloom the second include foxgloves, hollyhocks,delphiniums, and Canterbury Bells. Perennials include geraniums, penstemon, coreopsis, Shasta Daisy, Black-Eyed Susan, Coneflower, Gerbera Daisy, lupines, columbines, and many wildflowers- all spectacular in bouquets! Evergreens, ornamental grasses and ferns, berry sprigs, fruits, rose-hips, and vining tendrils all make excellent accents in flower arrangements. Again, most things can be grown equally well in containers, beds, and side-yards. It is just important to make sure that your selections have the same light and watering needs when combined in a planter or bed. 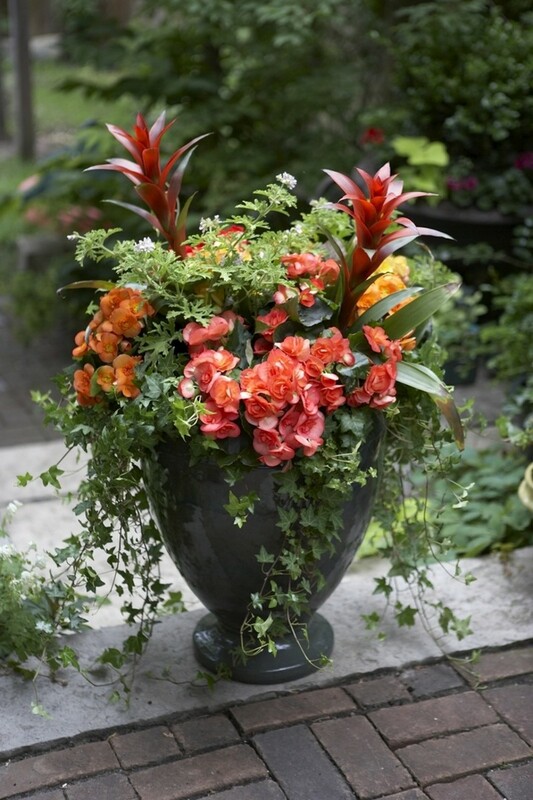 Container gardens offer the freedom to change a look easily with limited expense and effort. Unleash your creativity with easy container gardens using the popular concept of the "thriller, filler, and spiller" combo. Create inviting and peaceful retreats. 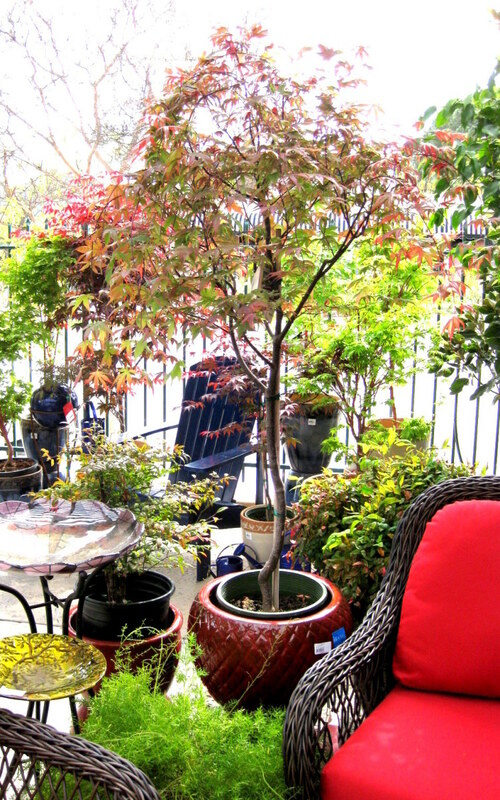 When creating a personal outdoor haven, think about the things that help you relax. Perhaps it's the soothing sound of a trickling water feature, the chirps and songs of feeding birds or the swaying of palms and ornamental grasses. Whatever it is that you wish to have surround you, you will want to have a place to sit to enjoy it all. If your space allows for it, an outdoor room with deep cushioned seating arrangements, lanterns, outdoor grilling and dining might be great- especially for entertaining. How lovely to experience a beautiful sunset with the fragrant waft from a flowering jasmine or a statuary garden with white iceberg roses reflected by a full moon! A small bistro table and hanging votives in the midst of planted containers might provide the perfect setting for a romantic glass of wine with your partner. For others, a short walk to a small sheltered, secret garden in an unused sideyard might be a slice of heaven. Your only limit is your imagination! Consider the ambiance of a fire pit. Make a cozy outdoor room. Stately trees, shrubs, lawns, and flower beds compliment each other nicely on a larger property and help define main entrances and specific areas of use. 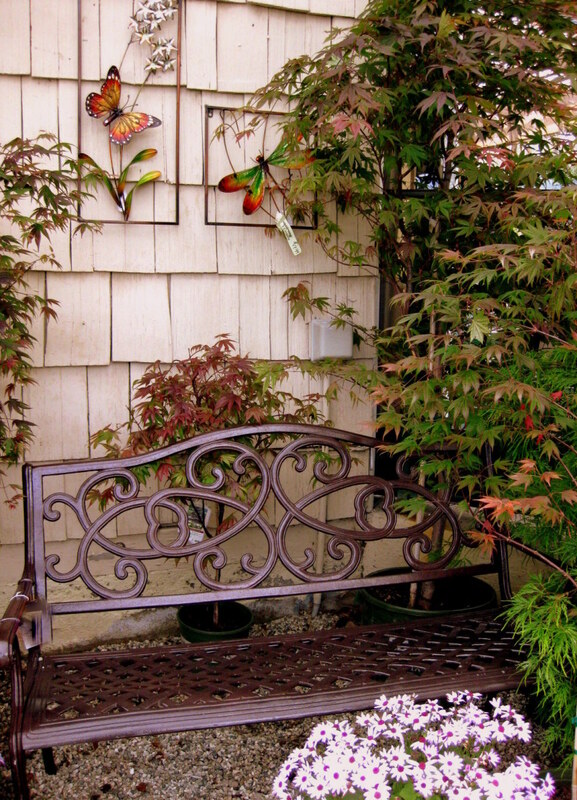 On a smaller scale, trees and shrubs work to provide privacy or give shade and curb appeal. Trees also serve as play places for children.and markers for the seasons as they bloom, change color, and drop leaves. Patios and balconies are more intimate but can contain the same elements often utilizing "up spaces" like walls or tiered containers. Side yards and backends of garages offer secret places and areas of sun for sprawling veggies like zucchini and watermelon. 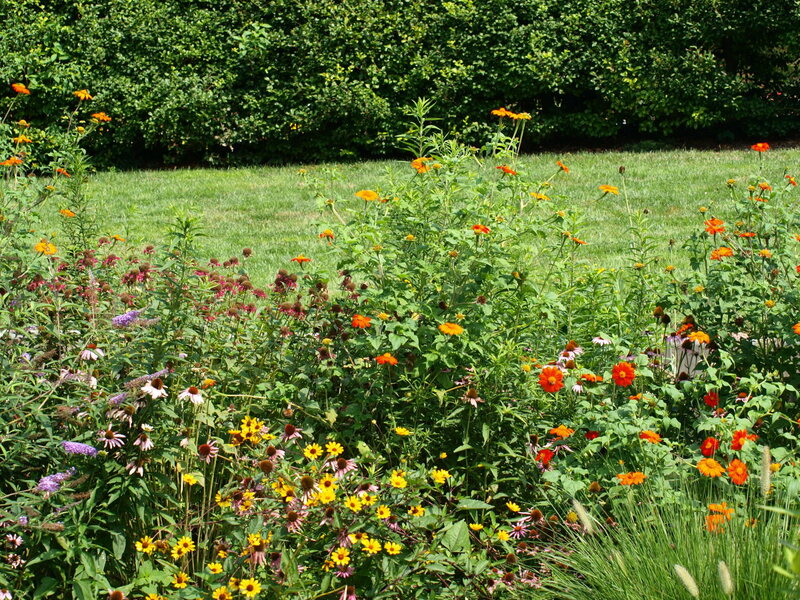 When choosing plants, pick for seasonal interest and attraction of birds and butterflies. Also think about what you want most from your garden. Is it edibles, flowers, relaxation or a combination? How involved do you wish to be? Time savers might be slow- release fertilizers, weed cloths and mulches, and timed water delivery. 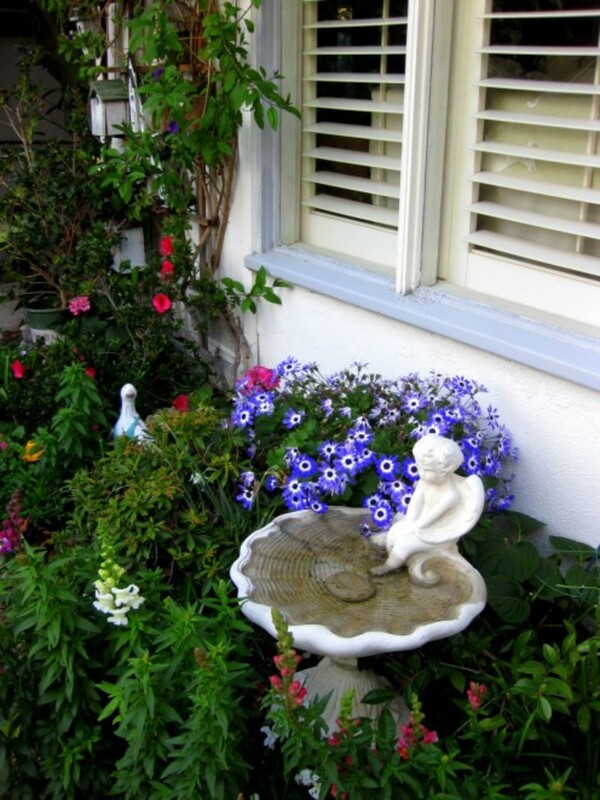 I garden organically and attract birds and beneficial insects by adding water features and growing a pollination bed. I keep weeding and pests to a minimum by adding layers of compost, leaf mulch, and worm castings to my garden. It needs little care, and is a wldlife haven! There is a garden for every personality and every need. The "perfect garden" can only be defined by the individual. Whatever it is for you, no matter your budget, it is within reach and can be had with a vision and a bit of passion to get the job done. No doubt, it is worth the effort! I just came back for another visit to your beautiful garden. I couldn't help but notice those lovely shutters in your window. I had some just like them in my old house, and just loved them. I loved looking at your flowers. 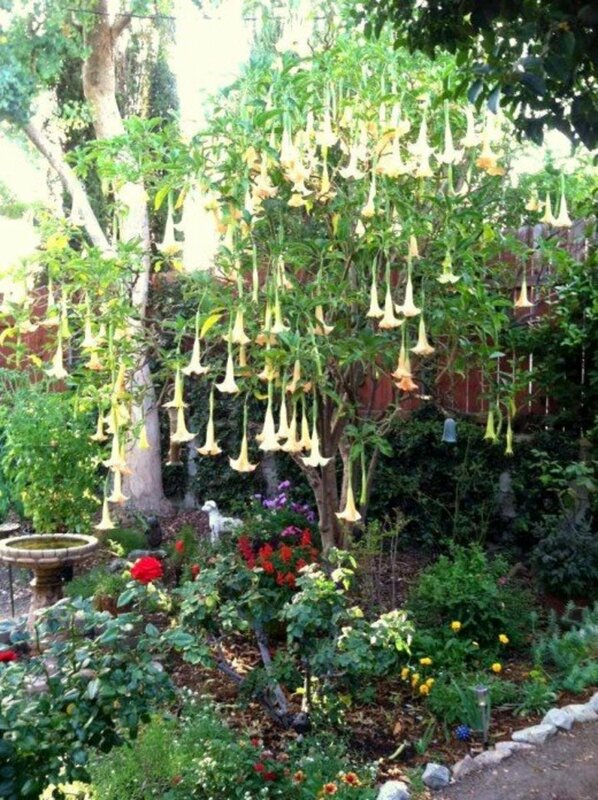 I grow the Angel Trumpet, too. Most of my gardening is done in pots since I have very little yard space in my new apartment. Well, you know the sad story of my tomato fiasco , now I'll stick with flowers. Going to share this lovely Hub here and will Pin to my gardening board. cat on a soap box Hi. What wonderful information and photographs. So many different layouts and colors. You have given me so many great ideas. What a beautiful garden you have created!!! Just lovely!!! Sharing this! Hi, Millionaire Tips! You've made me smile with your comment about being too lazy and wanting to move in. haha! 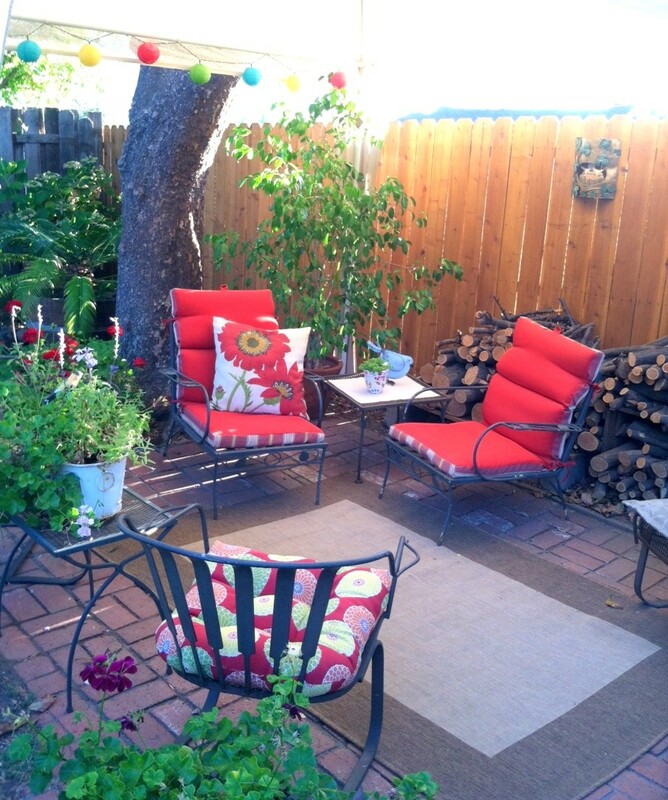 It sounds like a potted palm, chaise lounge, and small table for a margarita would suit your garden style! Of course you can come visit, but be warned that I might put you to work if you move in (: I really appreciate your congrats and compliments- thanks for stopping by! Congratulations on Hub of the Day. With all these gorgeous photos and wonderful descriptions, I can already picture myself in your beautiful garden. I'm too lazy to work on my own, but I am ready to move into yours! I really appreciate you stopping by to read and comment. It makes me happy to hear that my advice and suggestions were helpful to you and that you will share it with your father! Thank you for your thoughtful compliments. Very informative hub about gardening. I learn much from you and I'll share this hub with my father. He loves gardening too. Nice pictures and I really enjoy reading this hub. Rated up (useful, awesome, beautiful, interesting). Take care! Glad to hear that you planted dwarf fruit trees- you really can't go wrong. I hope they are coming out of dormancy and showing promise. I just planted a dwarf Eureka lemon since I'm always using them and love the convenience of backyard culture. Thank you for your kind comments both here and as a new follower. I am looking forward to the exchange of our ideas on gardening and such. Thank you for your nice comment. It is so full of positive energy! Yes, mother nature provides us with so much to enjoy. Rosemary, Thank you for your kind comments and support! I always enjoy hearing from you and wish you the best. An inspirational hub with some very good ideas. Love the idea of the hanging vegie plants. Lovely photos, a great article. Congrats on gatting Hub of the day. Hi,Liz. I couldn't agree more! That's one of the nicest things about a garden. People are drawn towards them for the peace and beauty they offer, and it's great to share cut flowers and edible harvests with our friends. I really appreciate your stopping by to read and comment. Thank you! It's good to see you here, BlossomSB. I'll bet a whole row of the verge gardens are quite attractive! Here in our urban areas of So. California, we manage to squeeze in some good community gardens where each gardener gets a good plot to work. I'm really happy to see this trend toward edible gardening expand to schools too. Your hub on small space/container gardening was really good, so I am especially pleased that you found some good ideas from me as well! Thank you- I wish you contentment and a bountiful harvest. Some great ideas here. I can see that you have written about a very popular subject. I loved the pictures. The latest craze here is to have 'community' gardens by neighbours making them together in what we usually call nature strips outside our fence before the road. As they are on the verge, they are being called verge gardens. Thanks, rebecca. I'm so glad to hear that I've given you some good tips so you'll be able to spend more time relaxing in your garden! I really appreciate your comment and wish you many happy hours outdoors in your favorite spot. 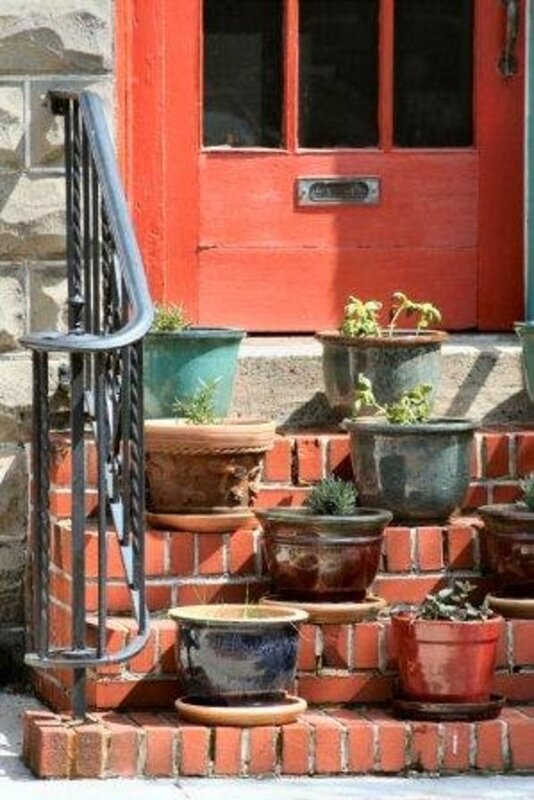 Fantastic ideas that help make gardening easier to undertake in challenging places! Hi, jennywu! Thank you for the nice comment. I hope you'll share a hub about your ideal garden one day. I'd really love to know what you create. i like this thanks you for sharing this, really got some great ideas about my ideal garden. Hello, livingpah. Spring is here, and that is the greatest motivation! I am glad to have given you some inspiration and ideas to get started. Once you get a bit of confidence in your garden, there will be no holding back your creativity! I really appreciate your awesome comments- Thank you. Well, RTalloni, I prefer a relaxed garden too, so I can overlook a few weeds and enjoy the birds while my cat watches the grasshoppers and lizards! We often have certain expectations of garden upkeep, but gardens are surprisingly more sustainable with less work. Thanks for your thoughful comments! Thank you, Rev.Atkins. I'm pleased that I've inspired you to consider that vegetable garden. Not only will you get the benefit of freshness and vine-ripened taste, you will have a great opportunity to get the family to work together AND you'll have plenty to share w/ your community too! Bless you for your kind comments. I'm glad you stoped by. Hi, Marlene! I'm really delighted that you enjoyed my hub and the accompanying photos. You could say that gardening and nature photography are two of my passions! Thank you for stopping by and leaving such a thoughtful comment. I enjoyed your hub re. saving plant tags. This has been a helpful gardening tip for us- esp. my husband who enjoys many varieties of both tomatoes and peppers! Wow! 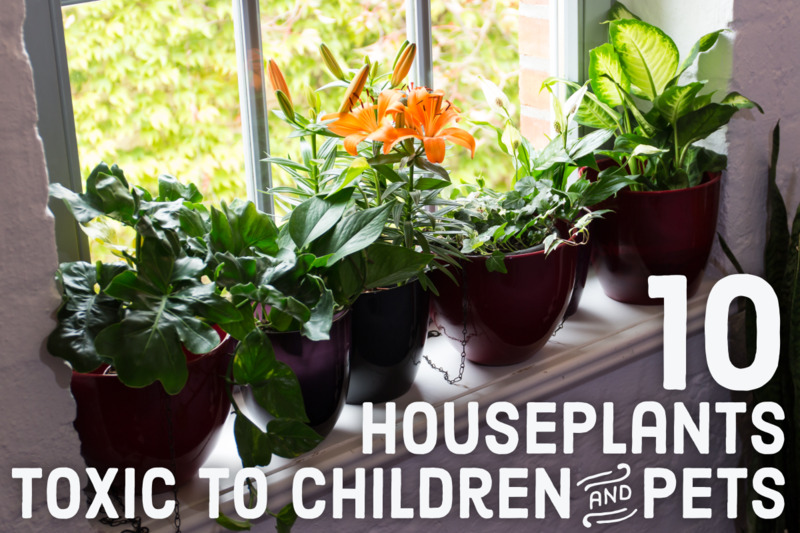 What a great article on gardening the easy way! I am so motivated to start gardening right away. Very useful and voted up!Congratulations on getting Hub of the day award! Thank you, Mark. I really appreciate your thoughtful compliment! I actually envy the weather there in the UK- especially during the summer when I am ready to escape the 100+ degrees that bake my roses. Glad you stopped by! Thank you, Mary! I'm so thrilled to be receiving this praise from such good fellow writers. It pleases me to hear that you will be adding veggies to your garden- that's wonderful! I hope it becomes an ongoing habit. You just can't beat home-grown taste and freshness! Hi VictoriaLynn. It's always good to see you here! Thanks for your support and wonderful comments. I hope I was able to interest you with an idea or two. Wow, now that covers a lot of different kinds of gardens. Great Hub, I like the different options and thoughts. Hoping to have a garden this year, my family really enjoys fresh vegetables throughout the summer. Gorgeous pictures! I really enjoyed reading all the wonderful tips. This is just awesome really, what a beautifully written Hub and a just winner too, congratulations and thumbs up to gardening. You certainly deserve the Hub of the Day! I hope you entered this into the contest for gardening. How beautiful! You have inspired me to expand on my little garden to grow some veggies. I voted this UP, etc.etc. Hello,AnnaCia. I'm so pleased that you stopped by! Thank you for the positive feedback and thoughtful comments. Thank you,prarieprincess. It is the best feeling to know that the love I have for gardening has filled your heart and encouraged you to try something you've never done before. 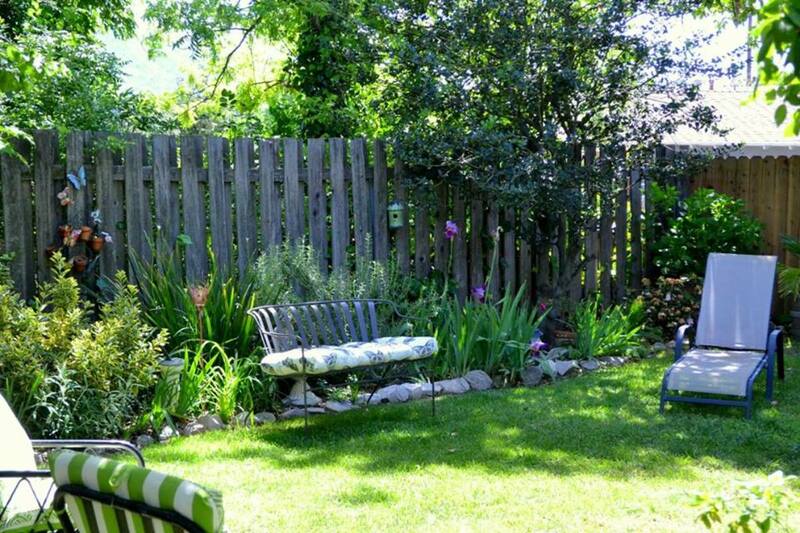 Yes, even the smallest corner or neglected side yard can be made into a useful growing space. All of the best! I did see this hub before today, and when I first saw it, I thought what a beautiful hub it was. Great ideas and gorgeous pictures. I am not at all surprised that it's the Hub of the Day. Congrats. Great job! Many votes! Hi D.Juris Stetser. I appreciate your nice comments! It is the best compliment to find out that I have inspired you to get out into the garden! I hope you have a wonderful weekend-Thanks for stopping by. Hello, vespawoolf. Iam delighted that you enjoyed some of the ideas in my hub and hope that you are inspired to try a few. I really appreciate your kind comments and congratulations. Thank you for stopping by! Thank you, shanemartin. Thanks for stopping by! Thank you, Donna! I really appreciate your nice comments and am glad that you stopped by. Thank you for the great compliments, Lillyeth! 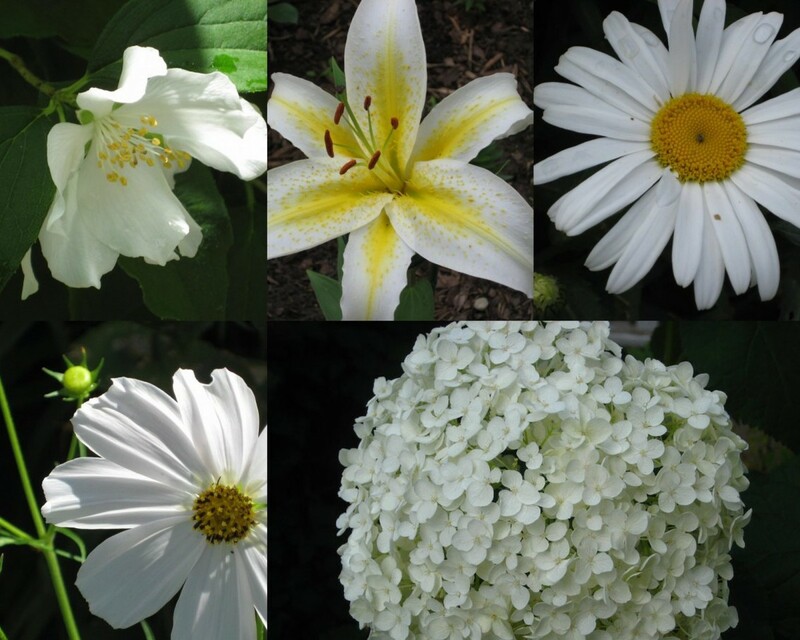 Some of the pictures are from my own garden. Two of the furniture groupings I took at a local garden center. I'm happy that you enjoyed my hub! Hello,raakachi. Thank you very much for your kind compliment. I am so happy that my passion for gardening has inspired others! I'm pleased too to see that you are a new follower! Hi Donna! Spring is so inspiring, and I'm glad that you will be out in your courtyard garden. Thanks for stopping by. Thank you ... this was so encouraging! I want to start more gardening in our yard but have never done it before. This was beautiful and shows that a garden can grow anywhere, even in a very small space. Voted up, beautiful, awesome and interesting. I just loved this Hub. So many great ideas I'm going to try out this week, so thanks so much, and let me add my congratulations on your "hub of the day"! 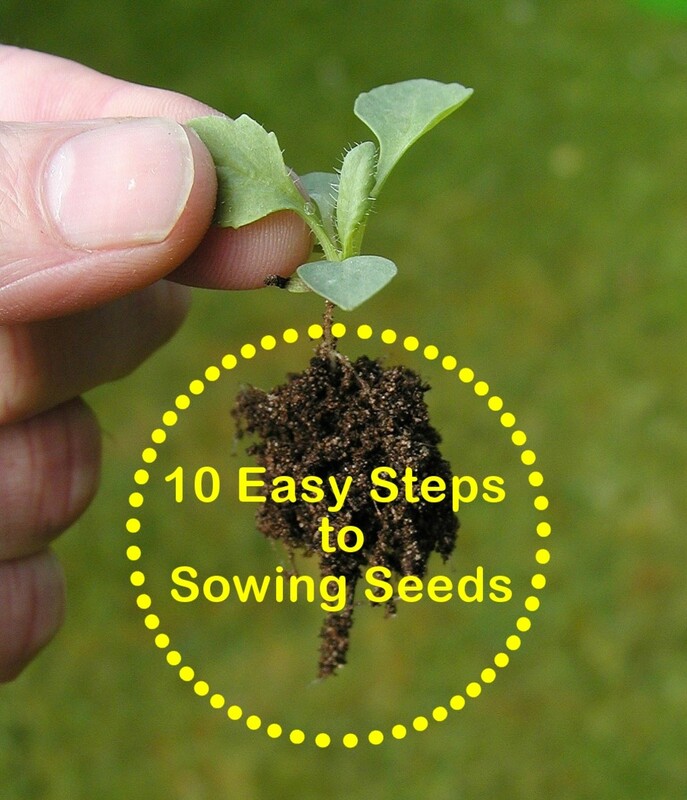 I like gardening and as i reached to your hub i found it very informative and useful. By the way congratulation from my depth of heart on "hub of the day". You have done a great job. This is a great hub. I love your garden ideas...especially the relaxing personal haven. Congrats on HOTD! Excellent job with the images because they really added to the overall reading experience. Congratulations on the Hub of the Day award; voted up. Congratulations on "Hub of the Day" award! Your photos look like they came out of a catalogue. Great job. My hearty congratulation for your well done informative hub on gardening and it's various colors. Voted beautiful. As spring days are ahead I am outdoors with many new plans for my courtyards. Great Hub. very informative hub on gardening styles...loved all the styles...congratulation for getting "hub of the day".